These deposits occur within a province of proterozoic sediments, which include sedimentary iron formations. Mining was originally for copper, but the high bismuth levels were a serious problem. Gold became a primary target later in the life of the field and the main gold ores were not coincident with the high grade Cu ores. The mines are all hosted in magnetite-chlorite or haematite rich host rocks, with quartz as a lesser accessory mineral. Some mineralisation models proposed entirely syn-sedimentary deposition in the iron formation units. However, these lack widely dispersed Cu or Au and there must have been another mechanism to focus and concentrate the ores into discrete deposits. Hydrothermal events are implicated in order to form the ore deposits. Because quartz is absent, or is a very late, non-ore stage in most cases, the only record of the hydrothermal fluids is within the opaque minerals. In this study, magnetite and haematite were analysed from numerous ore and background locations within the district. The baro-acoustic decrepitation of these opaque minerals was often intense, confirming the presence of fluid inclusions as well as the applicability of the baro-acoustic decrepitation method to study fluid inclusions in opaque minerals and quartz deficient deposits. This map shows the regional geology of the Tennant Creek field with major mine locations. 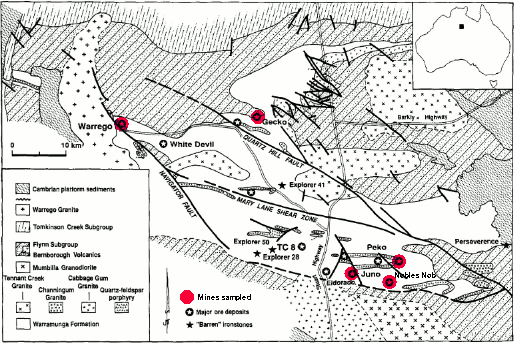 The locations of some of the mines in this study are highlighted in red. This map is after Zaw et. al., Microthermometry and geochemistry of fluid inclusions from the Tennant Creek gold-copper deposits....., Mineralium Deposita, 1994, V29, pp 288-300. Additional geological information is published by Ross Large, Zonation of hydrothermal minerals at the Juno mine, Tennant Creek Goldfield, Central Australia, Economic Geology 1975, V70 pp 1387-1413. The economic ore deposits at Tennant Creek are associated with haematite and magnetite with little or no quartz. This limits the application of conventional fluid inclusion methods which require a transparent host mineral. However, the baro-acoustic decrepitation method can provide some information from fluid inclusions in opaque minerals. At Tennant Creek, both the haematite and magnetite can contain abundant fluid inclusions. Although there is not a direct correlation between the decrepitation pattern and economic value at the regional scale, the method clearly shows the great hydrothermal complexity of these ores and that they are not merely synsedimentary stratigraphic deposits as sometimes proposed. The baro-acoustic decrepitation method has potential application on a mine scale for discriminating between individual hydrothermal events to assist in mapping out variations within the ore which are undetectable in hand samples. The Warrego mine was the largest and best studied deposit in the field. Here, the copper and gold occurred as close, but distinctly separate pods within the magnetite, chlorite, quartz host rock. Magnetite comprises more than 50% of the host rock. Samples of magnetite show intense and very variable decrepitation patterns, indicating a complex hydrothermal history during ore deposition. Note the intense decrepitation of analysis f216 (blue) which contained some 100g/t of Au. Analyses f209 and f210 are of differing magnetic separations of the same rock sample, collected at the surface near the mine headframe. Analyses f209 and f796 are samples from underground. Based on the lack of decrepitation below 400 C it is suspected that these fluid systems lacked a high density CO2 rich fluid component. 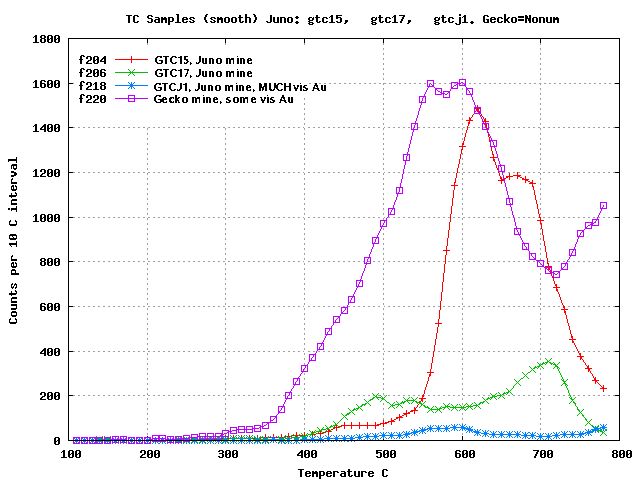 Magnetite samples from the Juno and Gecko mines also show very variable decrepitation. 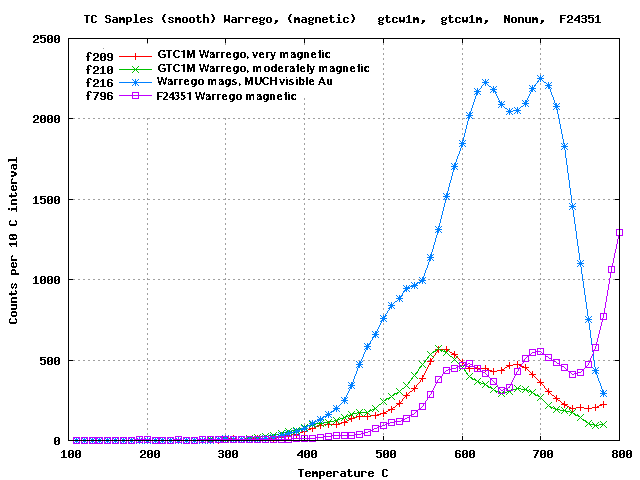 Note that the very rich Au sample at Gecko, f218 has quite low decrepitation in contrast to analysis f216 at Warrego and f220 at Juno. The decrepitation response alone does not correlate with Au content across the field and each deposit has to be studied individually. Surface samples from various small diggings show the range of decrepitation from areas lacking economic mineralisation. Only analysis f148 (red), from the Ace prospect is of magnetite. 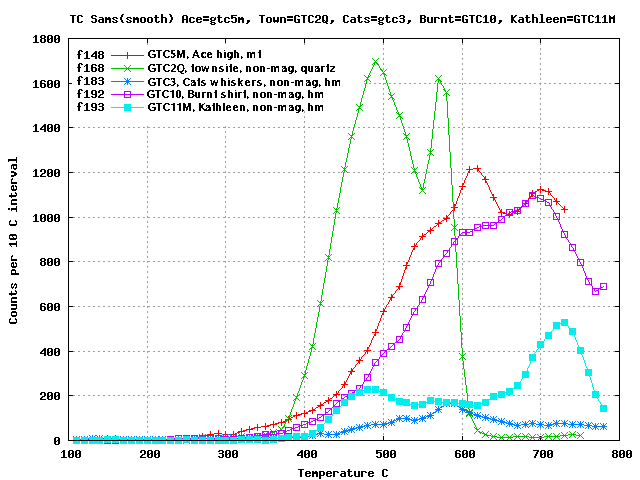 Analysis f168 (green) is of quartz and lacks decrepitation above 600 C as expected for quartz. The other 3 samples were of non-magnetic iron oxides, probably haematite. Note that haematite can give intense decrepitation and must be a primary hydrothermal phase rather than a supergene alteration of prior magnetite, as such supergene alteration would have destroyed any fluid inclusions and given weak or no decrepitation response. The Nobles Nob deposit was almost entirely within haematite host rocks rather than magnetite, but was a very significant gold producing mine. It is proof that in this field, magnetite alone is not a guide to the ore deposits and that hydrothermal systems are the real target. Because the pit was inaccesible, all of these analyses are of non-magnetic surface materials from near the pit. 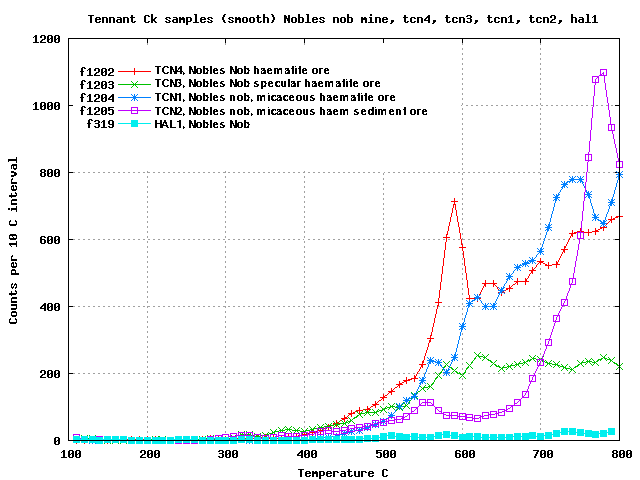 The peak at 600 C in analysis f1202 (red) might be due to a component of quartz in the sample. Brief descriptions of these samples are listed here. Although we cannot actually see fluid inclusions in these opaque minerals, the decrepitation counts have been shown to come from an irreversible event during heating by running the same sample aliquot twice, as shown and discussed here. Because the repeated analysis gives no decrepitation it is certain that the counts are not merely due to crystallographic changes during heating and come from the explosive decompression of fluids within opened inclusions.